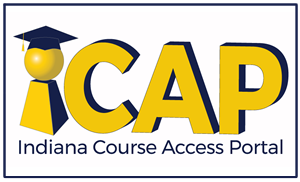 The Indiana Course Access Portal (iCAP) serves as a catalog of courses that provides options to help schools meet students' individual needs, expand learning opportunities, and diversify their curricula. The Indiana Department of Education (IDOE) approved pilot offering of courses in areas of high interest or need for student participation in 2018. Indiana Code 20-30-16 requires that course providers be authorized by the IDOE.